She will probably enter "why clouds are white" into a search engine. When she reads over and over that clouds are white "because they scatter all wavelengths of visible light," she thinks everyone is chickening out of answering the question, so she studies "scattering" in her meteorology books and eventually draws some pictures (below) and writes a few things about scattering. Which does not make for very compelling reading. * So the writer plunges head first into figuring out what this means with the help of several books on physics, optical phenomena, and atmospheric antics. 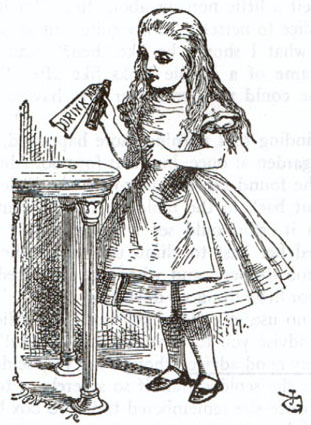 And then when she has just enough learning to be dangerous, she heads back onto the Internet with a very question about the interaction between sunlight and water, specifically, how the wavelengths of light interact with the water molecules that make up the cloud droplet. Having asked this question, the writer will probably want to spend an entire week on understanding the answers. She will find herself on the NASA website and then the Max Planck Research School for Atmospheric Chemistry and Physics where she will giggle when she discovers her answer might come from a group of scientists called SATCHMO, the acroymn for Synergetic ATmospheric Transport CHemistry MOdellers. But they are in Mainz, Germany, and because she does not speak German or understand physics, she decides to bookmark the site and move on. She is lured into hyperphysics, where she spends an entire day there (due to her Attention Surplus Disorder), she e-mails a few meteorologists, joins Open Study--a website where 100,000 students from 1,600 schools in 170 countries can ask questions, give help, and connect. The site claims that "75% of questions are answered in 5 minutes." But not how light behaves inside a cloud droplet, which is much smaller than a raindrop. And moreover, this looks like geometry! The raindrop is just a circle and the light is just straight lines. She posts a thank you and follow up question on OpenStudy and is told her question is beyond the scope of first year Physics. Certainly someone can tell me what is going on inside that circle and along those lines. Anyone? Anyone? ...describes the relationship between the circumference of a particle (pi times the diameter) and the wavelength (lambda symbol). If the particle is larger than the wavelength (particle size divided by wavelength), X will be greater than 1; if the particle is smaller, X will be less than 1; if the particle and wavelength are the same size, X will be 1. That number, 1, is not a measurement of size but a parameter. The size of what is being measured is in micrometers and nanometers. Depending on the value of X (=,<,> 1) the light will be scattered in different ways. But why? I don't know yet. Stay tuned for the why of blue skies and white clouds and rainbows. In "MIT Open Courseware", "Rainbows", "SATCHMO", "Walter Lewin", "hyperphysics", "why clouds are white"
When you imagine an atom to resemble a 2-D planetary model, you have all sort of problems. 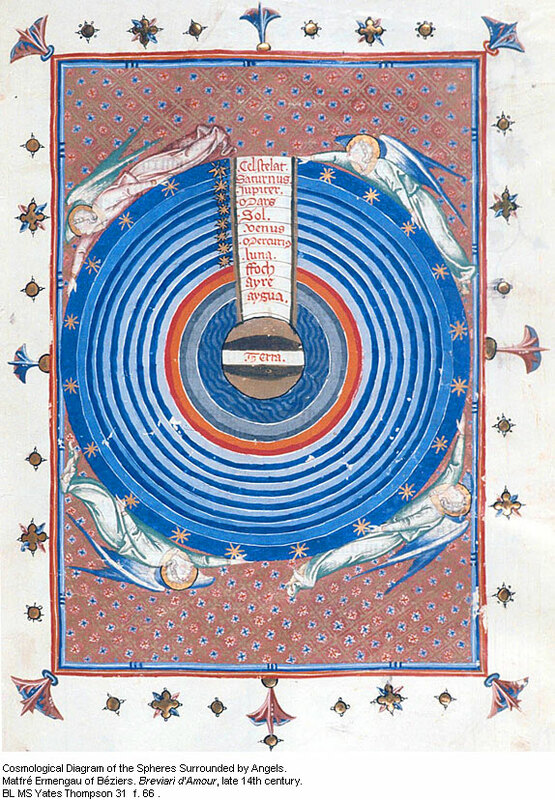 When you imagine a planetary model like this one from the late 14th Century, you are really in trouble. Readers: It's been a doozy of a week trying to figure out exactly why clouds are white. After I posted Part One, I was convinced that I would find the answer to my question deep within the clouds. So I started traveling. I entered the cloud, then the cloud droplets, then the molecules of liquid water, the atoms of hydrogen and oxygen, and landed in the electrons. I had remembered the planetary model of the atom from high-school Chemistry and was having a really good time imagining myself an electron spinning around a nucleii of oxygen and hydrogen atoms. Wheee! It was like being on those swings at the county fair. But my fun ride ended when I imagined getting bombarded by a powerful beam of pure white sunlight. In no time, I was knee-deep in quantum mechanics trying to calculate how each electron would react to each of the different wavelengths (red, orange, yellow, green, blue, indigo, violet). I was staring at diagrams of electrons (small dots) being so excited by a certain wavelength (a squiggly lines) that the electron jumped from its "home" orbit into the next higher orbit. I mean, I was really down there in the cloud with Neils Bohr and Max Plank. But that's not where I needed to go. I needed to play pool with my friend, Kevin. Kevin is a faithful and critical reader of "The Accidental Naturalist" and has been supplying me with a steady stream of solid science and valuable metaphors...especially when it seems I have lost my way in the atmosphere. After seeing my model of the atom (above) from my previous blog, Kevin wrote, "Electron shells are dead, Maria. Long live hybrid orbitals!!!" It took me three days and many e-mails to figure out what he meant. And though I have been reading a few textbooks on the topic of scattering, my meteorology book does not really explain the chemistry of scattering and my chemistry book does not explain. So Kevin came to the rescue in his latest e-mail, the gist of which was, "Get thee to a pool hall!" There is no formula to describe what happens when you break, when the cue ball hits sixteen densely-packed billiard balls. I think there are innumerable interactions that occur when a light beam strikes a cloud droplet, just like when the cue ball hits the racked balls on the break shot. On the break shot, the cue ball strikes the lead ball, which absorbs the cue ball’s energy. The lead ball then passes some of that energy to the two balls behind it. There are probably hundreds of energy absorption/emittance reactions in the break shot. A light beam hitting a cloud droplet is like a billiard break shot with billions of racked balls. At the atom or molecule level, all the fundamental wavelength-dependent interactions occur. But the droplet is so dense, and there are so many simple interactions between photons and individual atoms/molecules, that collectively it all gets scattered. I think Kevin is right and this is great metaphor (even though I pocket the cue ball on the break shot.) I still cannot understand how different that scattered light appears to us with what seem to be infinitesimally small variations in the size of the water droplet. How can a raindrop cast a rainbow when a smaller cloud droplet casts white light? There is something about the mechanism of interaction I do not understand. So, stay tuned for the dance of the photons and electrons! In "clouds and light scattering", "why clouds are white"
Still searching for an answer up here. Oh, I have been struggling this week to finish Part 2 of this post in which I sought to answer my own question: why are clouds white? I hate to disappoint my readers, but I have not been able to find a satisfactory explanation--one that really explains why. There are many explanations out there just as there are explanations for why the sky is blue. I nod at the answer to this one ("because air scatters blue wavelengths of light more efficiently than the other wavelengths in the visible spectrum"), but guess what? I don't really know what that means. Because I want to know what it means, I am now way down inside the water molecules that make up the clouds, inside the atoms of hydrogen and oxygen, riding the waves of the electromagnetic spectrum, to try to understand what happens to the electrons (if anything) when they are struck by sunlight. This is getting me close to an answer, which is why this is Part 1.5. I am not quite there yet. Here is what I know: The reason clouds are white has to do with the relative sizes of the cloud droplet and the wavelengths of visible light. Which are both very very incredibly very tiny to us. To a cloud droplet and a wavelength, however, size does matter, though telling you that a cloud droplet is so large that is scatters all wavelengths equally (which is what I am being told) doesn't really explain the phenomenon of white clouds. So you are confident that The Accidental Naturalist is working diligently on the uber-story of the whiteness of clouds, I am reading a 1970 article from the Journal of Atmospheric Sciences (Volume 27) entitled "On the Possible Absorption of Visible Light by Clouds," by S. Twomy. It was the first article that showed up when I asked Google Almighty this question: Are individual wavelengths of visible light absorbed and emitted within the molecules of water within a cloud droplet or are they scattered without ever penetrating the droplet? Yes, 1970. That means I have some 41 years of articles to read to bring you the latest science on this very basic and possibly unanswerable question. Here is a loaf of bread I made on Sunday. It was delicious. When I get lost in the atmosphere, I like to come back down to earth in the kitchen. In "cumulus fractus", "why clouds are white"